Adecco is a world renowned professional staffing agency which supplies a great number of jobs within a variety of industries and sectors. Earlier this year, they faced a great challenge in Norway. Traditionally, the company has been associated with low profile jobs despite the fact that they also dealt with high-paying corporate ones. The challenge was to change this preconception, especially among university students and young professionals, and to attract ambitious individuals to join the company. What did they do? 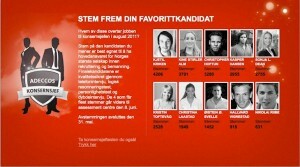 Adecco Norway offered university and college students the best summer job there is. Between January and April this year, 2300 college and university students from diverse social and educational backgrounds applied for the chance to become CEO of Adecco Norway for 1 month with an approximate salary of 100,000 Norwegian Kroner, as well as living and travel expenses. The applicants were screened through telephone interviews with the top 90 candidates receiving a logical reasoning test. 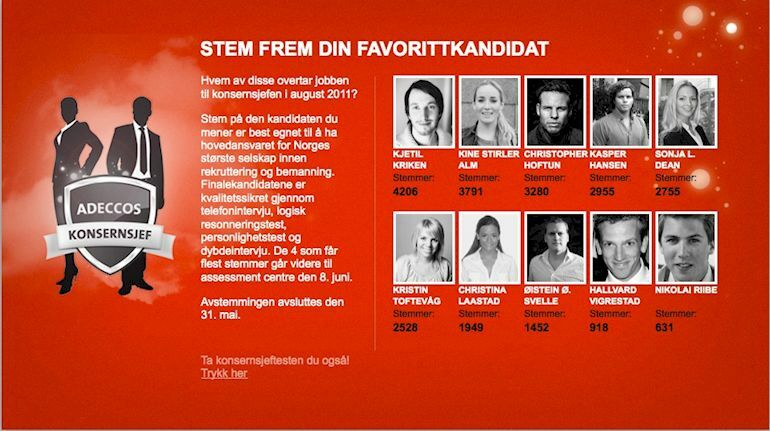 The top 10 candidates were then put up for a public vote through the campaign’s website. In order to win votes, the 10 candidates started running their own campaigns and ads. Some of the stunts during the personal advertising campaigns were then covered by newspapers and on social media sites. Some candidates raffled off iPads while one even offered a vacation in the French Riviera. Throughout the voting process, the candidates themselves courted the traditional media networks to cover their story and garner more votes. When the public vote closed, the 4 candidates with the highest votes were selected to compete at the “Assessment Centre”. During the live event, the candidates solved a variety of tasks in front of the audience and a jury, which included dealing with a difficult employee. At the end of the day, Kine Stirler Alm was announced as the winner and her experiences as CEO was documented in a blog and various social media sites. Adecco was determined not to let the campaign devolve to an expensive publicity stunt in the face of a media storm following the scandal in February surrounding their business practices. What they set out to do was capture the attention of young people and offer the winner valuable workplace experience by undertaking various CEO responsibilities. Kine Stirler Alm’s tasks included planning and leading a national executive meeting, preparing budget negotiations, evaluating the marketing plan and following operational processes within the company. On top of the sizeable salary, Anders Øwre-Johnsen worked closely with the vicarious CEO during her month in office and stayed on as her mentor for a further 6 months after the summer job was completed. How did Adecco execute their online and social media strategy? Website: They launched a custom built website on http://www.konsernsjefen.no/ which had details of the application procedure and contest details. In addition, they had an interactive CEO test as an application pre-screening tool on the site. 11,000 people took the interactive CEO test and 2300 proceeded to apply for the position. The public were then given the chance to vote for the top 10 candidates through the site. Adecco received 120,000 web votes and 8000 SMS votes (the SMS was limited to one vote per phone number) during the life span of the campaign. Facebook: Adecco created and posted on a dedicated Facebook fan page for students – Adecco Student which was launched in tandem with the campaign. They updated their status with brief profiles of the top 10 candidates and online articles from various websites mentioning the contenders. They also interacted with the general public’s reactions to the contestants. The group currently has over 1,100 fans. Twitter: @AdeccoNorge tweeted relevant updates with the hashtag #Konsernsjefen. The twitter account was used to spread the word about the application process and even interacted with the applicants even before the top 10 were announced. As seen on the graph above, AdeccoNorge tweeted actively during the campaign. Youtube: Adecco live streamed the Assessment Centre event to enable students outside of Oslo to watch the final challenge. They also posted a follow up video (http://youtu.be/RUzJdATrF1U) providing insight into the entire recruitment process and the Assessment Centre, featuring Anders Øwre-Johnsen and the rest of the team involved in hiring the summer CEO. Blog: When the campaign ended, Kine maintained a blog detailing her time as CEO and started tweeting as @KineStirlerAlm to further interact with the general public and sustain interest in the campaign. What happened after the campaign ended? Google Search Traffic: A quick look on Google Insights says that the search traffic for Adecco in Norway did not change dramatically after the campaign culminated in June. However, it would be interesting to see whether the search volume increases in the run up to summer next year, among students and young professionals to reflect the effects of this year’s campaign. Youtube Views: The Youtube video featured at the top of the article was uploaded a month ago. Since then it has been seen 2,451 times around the world and has been featured in several social media sites. This retrospective video could be the key in capturing more attention and sustaining the interest in Adecco beyond Norway’s border. In contrast, the behind the scenes video which was uploaded 4 months ago has only been seen 498. I suspect that the low number is due to the video being shot in Norwegian. If the video had English subtitles, there would be a lot more interest as I don’t doubt other companies would be keen to replicate this campaign in their local markets. Twitter: The Twitter account is growing at a relatively constant pace. In the run up to the Assessment Centre live event on the 8th of June, @AdeccoNorge saw a quick increase to their follower count (see graph below). This increase has since levelled off. Personally, I think that the campaign was brilliant and innovative. It was gutsy in a way that it attracted the attention of young people who are so used to being bombarded by traditional marketing campaigns. Furthermore, it offered them a chance to stretch their creativity and work for something that was a genuine opportunity for them. Unlike on the UK’s BBC Young Apprentice, the candidates on Adecco: Be The Next CEO were motivated by something more than 15 minutes of fame on television. A recent study by Universum after the campaign ended showed that Adecco.no is the first choice for students when looking for a job. What would you need to do to improve on this campaign? Allow video applications which the candidates can use to solicit for votes online from their friends on various social networks. By allowing for video applications, word of the contest would also spread as more people would find out about it during the applications period. In response to the challenges, I would get the candidates to submit their answers via a video response which would be posted on the organisation’s Youtube channel or the campaign website. The public can then vote for the candidates based on the video. The video can also lend a viral aspect to the campaign as it is something that the supporters can post on their friend’s Facebook walls, etc. Using the designated Twitter hashtag, the public could submit their own responses to the challenges summarised in 140 characters. It’s an idea that would encourage more interaction and hopefully get the public more invested in the campaign. Again this would hopefully help spread the campaign to more people. The most important thing however is what happens after the campaign ends? How do you capitalise on the attention your company received during its duration? Hopefully we’ll see Adecco leverage their social media accounts which are targeted at students, posting not only career tips but also job vacancies that they have in the run up to summer. Students rely on networking sites not only for information about their friends but also news relevant to them which would include jobs, housing advice, career tips, etc. Those are some of my ideas. Comment below if you’ve got more suggestions!